There, the AC 45 City can also take full advantage of another plus factor in its design: Since the base section of its fully hydraulic main boom is also particularly compact with its length of 7.80 meters, the AC 45 City is also able to work in buildings with a relatively low clearance while still keeping its boom at a steep angle. This advantage comes in handy, for example, when assembling overhead cranes, as the AC 45 City crane can lift heavy loads at a small radius. In addition, its fully hydraulic 31.2-meter main boom means it can get ready to start working much faster than comparable cranes with booms that need to be set up with pins. This means that the Demag AC 45 City is perfect for a wide variety of jobs. Another advantage is its vast configuration flexibility, which makes it possible to customize the crane perfectly for the requirements at hand - for instance, with the 1.3-meter-long runner for loads of up to 25 tonnes or with the three-sheave hook block, which allows for six-part reeving. And with offsettable main boom extensions of 7.10 or 13 meters, the system length can be increased to an impressive 44.20 meters. 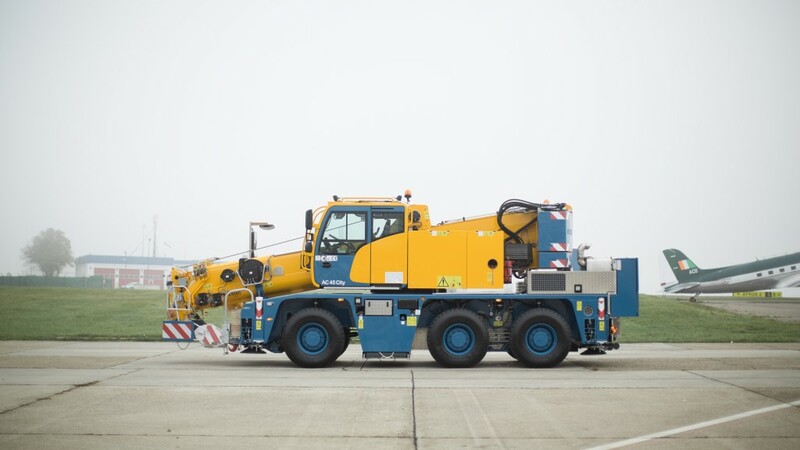 In addition, the Demag AC 45 City also comes with features such as an axle load indicator, a hook height indicator, cruise control, and cameras for load, hook and hoist monitoring and for backing up. Remote radio control and storage boxes are included as well. Without a doubt, one of the absolute engineering highlights of the new Demag crane is the innovative IC-1 Plus control system. The system determines the crane's lifting capacity for every boom position as a function of the superstructure's slewing angle, and in real time to boot. This means that the lifting capacity for a specific radius is no longer limited to the lowest value for a pre-calculated 360° lifting capacity, as used to be the case. Instead, the crane can always take full advantage of the maximum available lifting capacity. This advantage is particularly useful when it comes to lifts in which the outriggers are extended in an asymmetrical configuration, as it enables the Demag AC 45 City crane to take care of jobs that would normally be the exclusive job of larger cranes. In addition to the real time determination for lifting capacities dependent on slew angle, the IC-1 Plus control system also features the capacity radar which determines and shows the working range of the real time lifting capacity within +/-30° slew angle. Moreover, the control system features an automatic counterweight detection function that the crane operator needs to confirm. Together with the IC-1 Plus control system, the new Demag crane is additionally able to work with any outrigger configuration with continuously variable adjustments, meaning that the AC 45 City can be adjusted for all space conditions and load requirements. On top of this, and for the first time ever, the crane offers the possibility of working with the IC-1 Plus control system both when using the runner and when telescoping under load. The new AC 45 City crane is also characterized by the fact that it is designed to stay in the 12 t axle load limit, as the 3-axle unit does not weigh more than 34 tonnes even when outfitted with its full equipment. That way, the crane can get to work without the need for any additional transport vehicles. And when using a reduced counterweight, the crane even falls below the ten-tonne limit, meaning that it still can perform a broad range of lifts, as lifting capacities remain strong. And since it only weighs around 26 tonnes when not carrying any counterweight, a permanent permit can be obtained if need be. Premiere at bauma 2019: With its new electrohydraulic E-Pack, Demag is making its AC 45 City crane more versatile than ever before. In fact, the new unit not only enables the AC 45 City to work in crane operation with zero emissions, but also makes it significantly quieter. Accordingly, using the crane with the optional E-Pack is particularly recommended for buildings, city centers, and nighttime assignments in residential areas.